People all over Metro Vancouver and beyond are praying that many people will acknowledge the lordship of Jesus Christ during the Festival of Hope. Years of planning, prayer, training, cooperation – and some conflict – will bear fruit this weekend as the Greater Vancouver Festival of Hope comes to Rogers Arena from Friday to Sunday (March 3 – 5). One final pre-Festival prayer gathering will be led by Grace Chapel this evening (March 2), 6:30 pm, at Gate 10 of the arena. The Festival of Hope is a multi-phase initiative spread over several months that includes prayer, training and many opportunities for evangelism. The ministry culminates with a three-day festival. . . . Intended to draw thousands of people to hear the Good News of Jesus Christ, each evening will feature Christian musicians, testimonies and the Gospel message from Franklin Graham. This is a non-ticketed event with free admission. 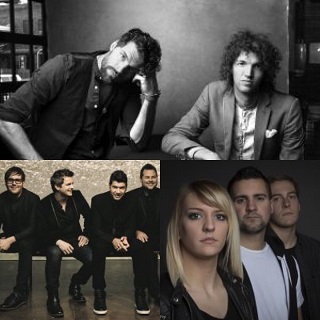 Clockwise from top: For King & Country, All Above Me and The Afters are among the bands that will be taking part in the Festival of Hope. Franklin Graham continues to attract controversy for his statements on political and social issues. I wrote about the opposition to Franklin Graham as the key speaker two weeks ago (Critics look forward to Festival of Hope – without Franklin Graham) and again last week (Festival of Hope set to launch next week, discussions continue). The day after last week’s article (February 24), 34 Christian leaders released a statement opposing Graham’s participation in the Festival (see below). They stated the serious critiques that have been widely reported in the media, but in my view the key elements of the statement – mostly overlooked by the media – were related to 1) the value of the Festival and 2) the importance of working together with fellow Christians in the future. We wish to make clear that we value the work our sisters and brothers in Christ have done in organizing the Festival, which intends to celebrate and share the true message of Christianity: the Good News about Jesus of Nazareth. 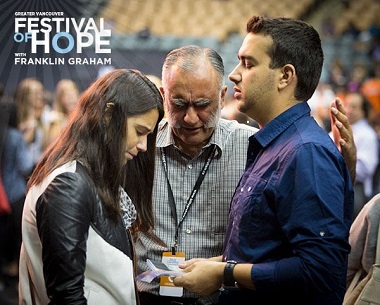 We pray that the Festival of Hope will be all that God wants it to be. . . .
We continue to respect Franklin’s father, the prominent evangelist Billy Graham, and we appreciate the life-saving work that Franklin’s international relief agency, Samaritan’s Purse, does in some of the world’s most challenged regions. It is not our intention to vilify the Festival’s organizing committee. We simply believe it is a mistake to think Franklin Graham’s political stances are immaterial to his presenting the Gospel. We want to continue to work with all our sisters and brothers in the faith, even in the wake of this controversy. We do not want disagreement on this one initiative to reverse the tide of cooperation that has been building for years now. Franklin Graham sent a letter to the concerned local leaders February 23, apparently aimed primarily at his supporters, explaining his position on some of the issues raised by the Vancouver leaders. They did not feel that he had adequately answered their concerns and released their February 24 Open Letter. See Graham’s letter below the Open Letter. We, the undersigned, represent a broad diversity of Christian churches, including evangelical congregations, and over 60% of the Christians in the metro area. We are releasing the attached letter regarding Franklin Graham being the speaker for the Festival of Hope, after nine months of dialogue with the Festival of Hope committee. Diversity of opinion is not a sign of disunity. It is a sign of health. We have learned from each other that unity is best achieved at the start of a journey together, before an irrevocable decision like the selection of a speaker has been made. Despite this diversity of opinion about Mr. Graham, we trust that many will find new life in Christ at the Festival of Hope over these next few days and that, irrespective of anything else, this city will experience the love of God in new and profound ways. We pray to that end. However, Mr. Graham has neither retracted nor sufficiently addressed the harmful statements to which we drew his attention, and which can be found here. Therefore, we are releasing our letter. We urge Mr. Graham to release the reply he sent us. We want to make clear that our letter was not written at the request of the City of Vancouver. It was already in draft form when a few of us met with the Mayor earlier this month. The Mayor called that meeting because he wanted to share his concerns and to ask what the Christian community could do to diminish the potential risk of inciting violence that he and the Vancouver Police Department perceived. We love and respect our sisters and brothers on the Festival of Hope Committee. We have worked together for many years and hope to do so for many years to come. Nonetheless, we feel compelled to clarify our concerns to the wider community, regarding our perspective on what brings honour to Jesus and on the Good News he asks us to share in word and deed. We are eager to dialogue further with our sisters and brothers about their concerns and ours – and with Mr. Graham if he is so inclined. As pastors and Christian leaders in greater Vancouver, we deeply believe in a Jesus who is “for” all human beings. He is so “for” us that he willingly died to teach us how we can have life to the fullest with him. We desire that all people hear his message of hope. 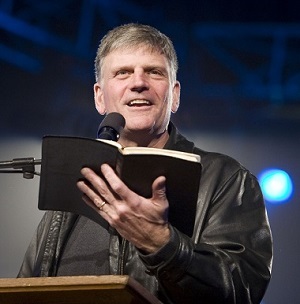 We are concerned that Franklin Graham, who is our brother in Christ, will be the keynote speaker at the Festival of Hope conference to be held here in March. Our concern is that the contentious and confrontational political and social rhetoric that Mr. Graham has used has the potential to overshadow the message of Jesus and incite hostility in our highly charged social climate. We wish to make clear that we value the work our sisters and brothers in Christ have done in organizing the Festival, which intends to celebrate and share the true message of Christianity: the Good News about Jesus of Nazareth. We pray that the Festival of Hope will be all that God wants it to be. Jesus’s life, sacrificial death, and resurrection ensure that justice will ultimately prevail in the world, that the universe will be restored to its full goodness and wellbeing, and that everyone may find in Jesus forgiveness of sin and reconciliation with the Creator who knows and loves each of us in our unique particularity. Jesus inaugurated his ministry in and for the world by announcing, “The Spirit of the Lord is on me, because he has anointed me to proclaim good news to the poor. He has sent me to proclaim freedom for the prisoners and recovery of sight for the blind, to set the oppressed free, to proclaim the year of the Lord’s favour” (Luke 4:18-19). Regrettably, Franklin Graham’s public comments appear to compromise Jesus’s mission of love and justice for all. He has made disparaging and uncharitable remarks about Muslims and the LGBTQ+ community, while portraying the election, administration and policies of U.S. President Donald Trump as intrinsically aligned with the Christian Church. The outcome of the recent U.S. presidential election was due to “the hand of God,” giving the impression that the Christian church as an institution is partisanly aligned with an administration and its policies. Such blending of politics and religion is dangerous. First, it comes close to aligning the power of the church with the power of the state. Second, it does so by seeming to develop a false religious narrative to support an exalted and troubling American nationalism. Third, it can divide Christians who do not view things the same way as Mr. Graham. Fourth, we are concerned that some of the policies of the Trump administration have introduced unprecedented structural shifts that put the most vulnerable in our world at risk of greater harm. These policies may jeopardize refugees and reinforce prejudice. Some examples of the incendiary speech Mr. Graham often employs can be found at whatfrankgrahamsaid.wixsite.com/whatfrankgrahamsaid. Statements like these do not convey the spirit of Christ that we would hope to see preached by an ambassador of the Gospel to Canada. Offering a Christian presence and witness in Vancouver is a lifelong task that belongs to all of us. Unfortunately it’s one we may find more difficult if our fellow citizens are given the impression that such remarks are representative of Christianity. Christians can legitimately disagree with one another on many issues of political and religious policy, and we do engage in ongoing conversation about these issues. Biblical ethics do not sort neatly into “conservative” and “progressive” circles, even less so among Canadian Christians than our American counterparts. We have attempted to resolve this matter through dialogue with Festival organizers, who we had hoped would be open to inviting a speaker with a message that more clearly aligns with the Good News of Jesus Christ. Unfortunately, our efforts have been unsuccessful. So with heavy hearts we have taken this unusual, painful step to speak publicly about our differences. Encouraging our elected leaders when they work for a just and peace-filled society that comes closer to God’s vision of flourishing life, while challenging them when they enact policies that oppress others. Next weekend, I’ll be with you in Vancouver to proclaim the Gospel of the Lord Jesus Christ. I am extremely grateful for your partnership in the Greater Vancouver Festival and want to ask you to join me in praying with urgency for your city, your community, your friends and your family. Vancouver desperately needs the light of the Gospel, and my heart, like yours, is deeply burdened for the lost in your city. The darkness hates the light, and our efforts will be opposed. I assure you that the sole purpose of the Festival is sharing the Good News of Christ; He is our only message. Unfortunately, some people may try to divert attention away from this by focusing on statements I have made on other matters. • I love Muslim people. The work of Samaritan’s Purse, the global humanitarian charity that I lead, is involved in helping the most vulnerable people of all races and religions. I’m sure you agree that Mohammed cannot lead anyone to Heaven – Jesus alone is the way, the truth and the life. I have witnessed first-hand the oppression that Sharia law brings and its violent application toward women and non-believers. Instead, I believe wholeheartedly in the freedom that the Gospel of Jesus Christ provides. • The church is a place where all people – gay or straight – are given the opportunity to find redemption and reconciliation with God. Advocacy for the gay lifestyle, however, runs contrary to what Scripture teaches. We will continue to love people enough to tell them the truth about sin, as defined by God, not man, and warn them of its consequences. I want people everywhere to know that we can be forgiven, cleansed and set free from the power of sin’s control by believing on Jesus Christ and trusting Him as our Savior and Lord. • I am for immigration, not against it. At Samaritan’s Purse, we work to help thousands of refugees every day in many different countries. As the church, we are called to reach those who are lost and hurting and introduce them to the Prince of Peace. That mission, though, has been confused with the role of the state, which is to secure its borders and protect its people. In the US, we must take time to vet who is entering the country. Just because we give medical care to ISIS fighters in our field hospital in Mosul, Iraq, does not mean that those fighters should be allowed to immigrate into the United States. The role of the church is to provide loving care, but the role of the government is to provide careful security. • When it comes to political party affiliation, I am an independent. I have no hope in the Republican party and no hope in the Democratic party. Neither party has shown the ability to deal with the complex needs of our country, and politics certainly cannot take the place of the church. Jesus Christ can change the human heart, and He alone is the answer to the problems of the world. God is bigger than any opposition we will face, and I am praying that He will use this event to transform many lives as the Gospel of Jesus Christ is proclaimed. Will you join me in asking God to draw many lost people to the Festival and to open their hearts to this message? In addition to praying, I hope you will reconsider and come – and bring as many lost people as you can so that they will have the opportunity to hear the Gospel and receive Jesus Christ by faith. Everyone is welcome, regardless of religion, ethnicity, age or gender identity. “I am not ashamed of the gospel of Christ, for it is the power of God to salvation for everyone who believes” (Romans 1:16, NKJV). Thank you again for partnering with us. May God bless Vancouver and bring a great spiritual harvest in British Columbia. The Billy Graham BC Mission drew daily crowds of from 19,000 to 47,000 over an eight-day period in October, 1984. Around 11,000 made commitments to Christ. As secretary of the executive committee and editor of what later became BC Christian News, I had a front seat. One night, I sat at the press table beside Gerry Bellett of the Vancouver Sun. Dr. Graham was preaching from the book of Daniel. After the sermon, Gerry turned to me and asked “How do you spell Nebuchadnezzar?” I couldn’t remember so I reached for the closest Bible, tucked under the arm of a nearby invitation counsellor, and opened it to Daniel. A photographer, Gordie Tong, caught Gerry and I looking at the Bible from an angle that made us appear, respectively, like counselee and counsellor. For the record, Gerry did not need any counselling. He was a good and professional journalist who, just days before, had written up a fine, objective and penetrating one-on-one interview he had done with the evangelist. Billy Graham’s gracious spirit and diplomatic approach built many friends for the Mission and the Gospel. Evangelism – and the world – have changed significantly in 33 years but the Good News, not so much. From my retirement perch, I will be praying that, whatever the controversies, many people will come to faith during this weekend’s Festival of Hope, and that some of his father’s grace and diplomacy will come through in Franklin Graham’s Gospel presentation. I hope that the public correspondence presented here and the stories you have reported on this event will be an example to the general public as well as fellow Christians of how various sectors of the church and Christian community can disagree with grace and gentleness, while retaining harmony and unity. And, of course, they have been a good example of balanced journalism. I enjoyed reading Mr. Graham’s letter. This man is on the cutting edge of Christian action abroad, while maintaining a very conservative but reasoned stance at home. Based on this letter, I would say this whole controversy has been blown completely out of proportion. Yes, let’s continue to be kind-hearted Canadian Christians, welcoming refugees. But can we honestly say our attitudes wouldn’t be hardened if we had spent time on the front lines in Iraq, trying to care for a dedicated enemy?